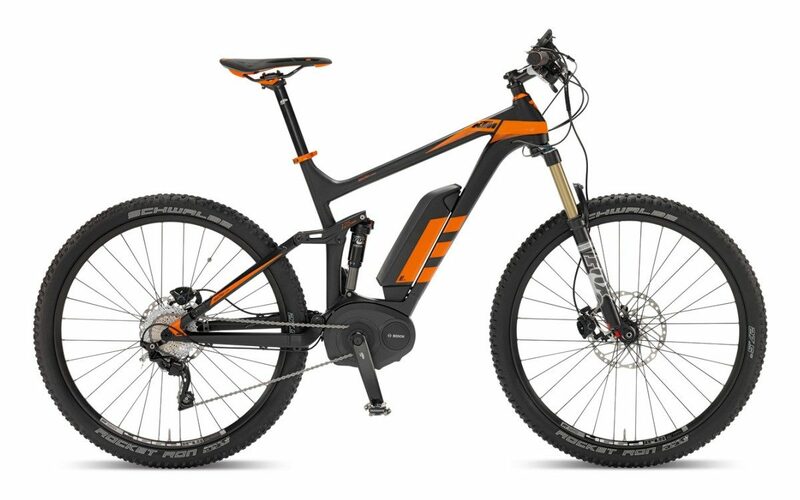 KTM are well known for making some of the best eBikes in the business – fact. The KTM Macina Lycan 27 is for running rings round your peers and is capable of full sized XC and trail rides far into the country wilderness. KTM increases the stiffness and durability of every pedelec to reach a high safety standard. Thanks to a specially designed down tube, the battery has a very deep position in the front triangle. This gives the KTM Macina Lycan 27 a very low centre of gravity and therefore supreme handling. The 3D alloy rocker reduces weight and ensures the very best in performance. Double sealed bearings guarantee long and frictionless durability and the tapered headtube a high steering precision. 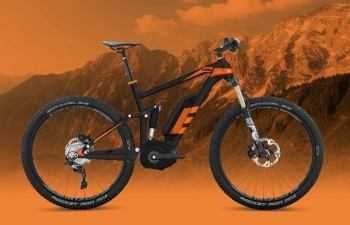 A direct mount front and rear derailleur offer a very rigid connection to the mainframe of the KTM Macina Lycan 27 which results in high shifting performance. The stiffness optimised bottom bracket construction in combination with a pressfit BB lead to an unmatched acceleration. Every pedal step is transferred directly on the road. A clean lookout and protection is ensured by an integrated cable routing. Overall, the KTM Macina Lycan 27 really is an exceptional bike. 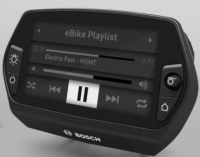 And of course….the KTM Macina Lycan 27 will be sporting the NEW Bosch Nyon computer………. With Nyon, Bosch eBike Systems is striking out in a new direction: you can check your elevation profile and battery range, set your assistance level and view the route to take you back home – all on one device. You decide which information is shown on the screen and where. You can set your own favourite screen in addition to the so-called ‘Ride’ screen by using the Bosch app on your smartphone. You can also set the eBike motor’s assistance models to suit you, so the new on-board computer enables eBikers for the first time to fine-tune the motor, comfortably for their individual needs. The 4.3-inch Nyon display is easy to read in all light conditions due to its ‘transreflective’ technology. Intuitive to use, it is remote-controlled from the handlebars. On the road, eBikers keep their smartphones safely and comfortably in their pockets, connected to Nyon by Bluetooth as required. The mobile phone’s music player can be remote controlled from the unit on the handlebars. Calls and messages are shown on the Nyon display. Texts can even be read on the display when the bike is stationary. When it is on the move this function is disabled for safety’s sake. Nyon’s navigation system is specially designed for the eBike with bicycleoptimised route calculation based on the Wiki Open Street Map (OSM). The GPS with Moving Map in 2D and 3D calculates the best eBike route. An optional extra is a smart remaining range calculator. Instead of a distance in kilometres environmental conditions such as topography and cycling behaviour are taken into account and the remaining range is shown clearly and comprehensibly on a map. Connect heart rate chest straps to Nyon by Bluetooth and it becomes a fitness and training control centre. Heart rate and pedalling cadence, cycling performance, calorie consumption and training efficiency are shown graphically on the display. En route and afterward, you can follow activities and training progress on the Bosch Online Portal and share them with others. The KTM Macina Lycan 27, what more could anyone want………..
For further information on the Bosch Nyon computer, click on this link: Bosch Nyon.